Info "Allow me to explain the rules of the duel. When you hear "DRAW", reach for pistol and fire! Good luck!" How the West Was Really Won is one of Ashley's Microgames in WarioWare: Smooth Moves. The name is a possible pun on the film How the West Was Won. 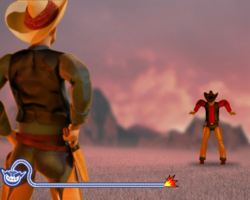 The player will engage in a showdown. When the word "DRAW" appears onscreen, the player has to quickly bring the Wii Remote up and shoot. Upon shooting, the opponent's undergarments will be revealed. The player can actually have the gun pointed up before the word "DRAW" appears; they cannot shoot, however. 2nd level difficulty: There is a shorter time to react. 3rd level difficulty: There is a short time to react. Both cowboys wear boxer shorts with Super Mario World sprites of Fire Flowers, Super Mushrooms and Super Stars on them. This page was last edited on October 3, 2018, at 09:10.